Statistical power and the effect of CO2 on the plant ionome. The effect of elevated atmospheric CO2 concentrations (eCO2) on the mean concentration of minerals in plants plotted (with the respective 95% confidence intervals [CI]) against the power of statistical analysis. 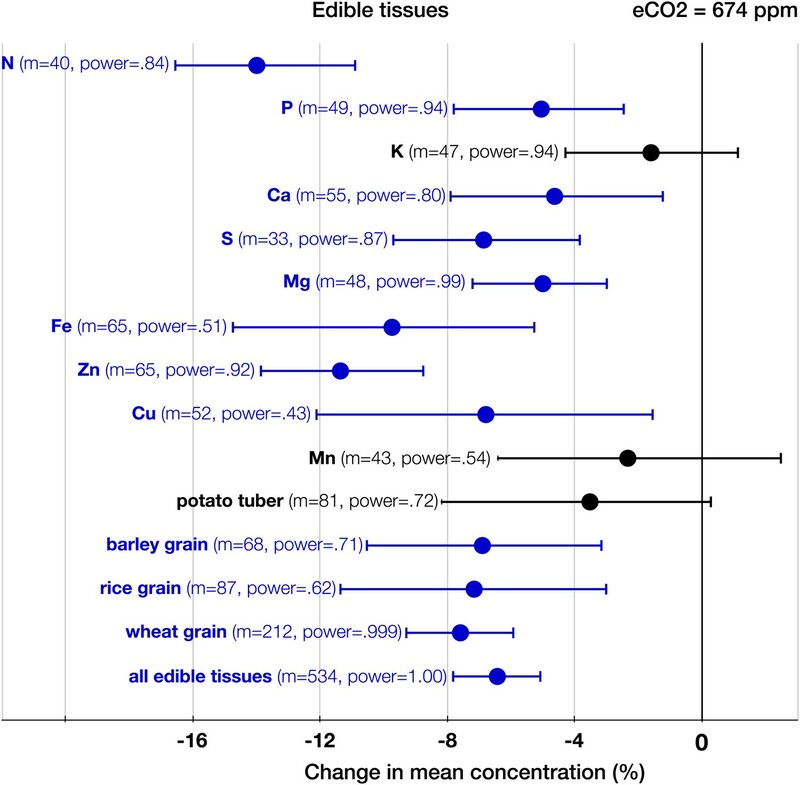 The figure reflects data on 25 minerals in edible and foliar tissues of 125 C3 plant species and cultivars. The true CO2 effect is hidden in the very low and the low power regions. As the statistical power increases, the true effect becomes progressively clearer: the systemic shift of the plant ionome. Supportive data for Figures 1–8. 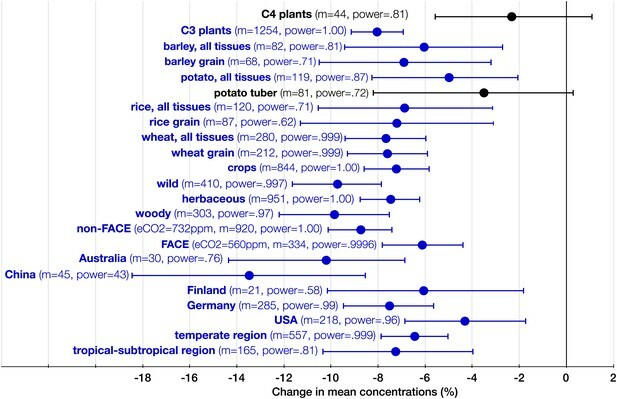 Change (%) in the mean concentration of chemical elements in plants grown in eCO2 relative to those grown at ambient levels. Unless noted otherwise, all results in this and subsequent figures are for C3 plants. Average ambient and elevated CO2 levels across all the studies are 368 ppm and 689 ppm respectively. The results reflect the plant data (foliar and edible tissues, FACE and non-FACE studies) from four continents. Error bars represent the standard error of the mean (calculated using the number of mean observations for each element). The number of mean and total (with all the replicates) observations for each element is as follows: C(35/169), N(140/696), P(152/836), K(128/605), Ca(139/739), S(67/373), Mg(123/650), Fe(125/639), Zn(123/702), Cu(124/612), and Mn(101/493). An element is shown individually if the statistical power for a 5% effect size for the element is >0.40. The ‘ionome’ bar reflects all the data on 25 minerals (all the elements in the dataset except of C and N). All the data are available at Dryad depository and at GitHub. Copies of all the original sources for the data are available upon request. The effect of CO2 on foliar tissues. 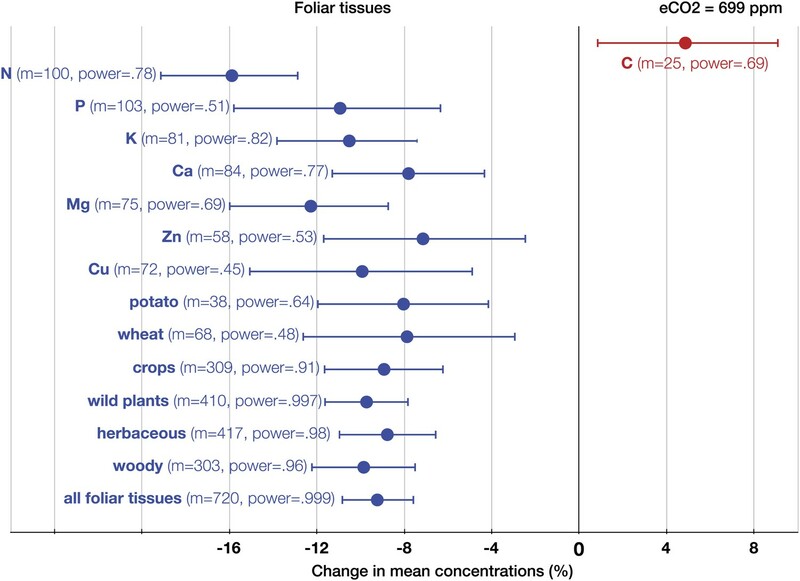 Change (%) in the mean concentration of chemical elements in foliar tissues grown in eCO2 relative to those grown at ambient levels. Average ambient and eCO2 levels across all the foliar studies are 364 ppm and 699 ppm respectively. Error bars represent 95% CI. For each element, the number of independent mean observations, m, is shown with the respective statistical power. For each plant group, m equals the sum of mean observations over all the minerals (not including C and N) for that group. 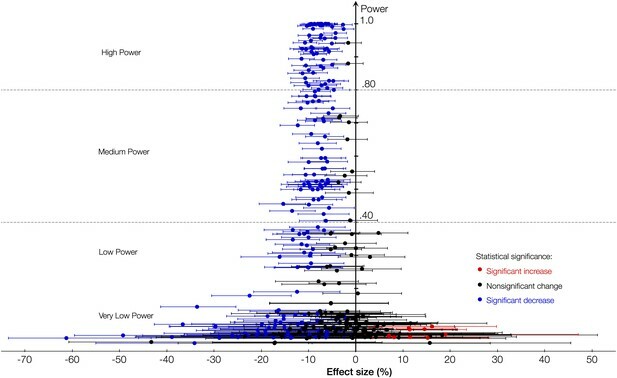 Elements and plant groups for which the statistical power is >0.40 (for a 5% effect size) are shown. The effect of CO2 on edible tissues. Change (%) in the mean concentration of chemical elements in edible parts of crops grown in eCO2 relative to those grown at ambient levels. Average ambient and elevated CO2 levels across all the crop edible studies are 373 ppm and 674 ppm respectively. Other details are in the legends for Figures 2 and 3. The effect of CO2 in artificial enclosures. 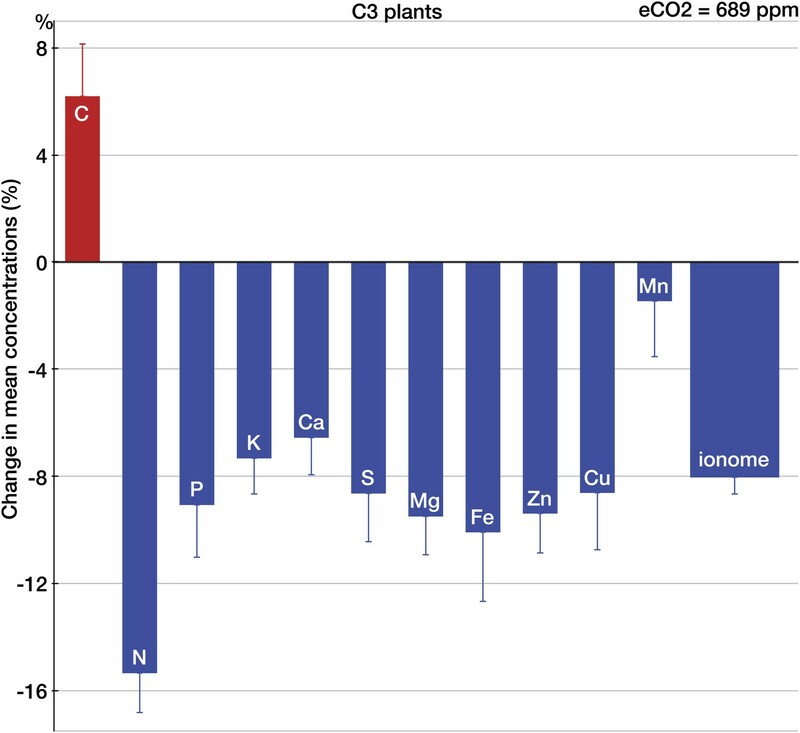 Change (%) in the mean concentration of chemical elements of plants grown in chambers, greenhouses, and other artificial enclosures under eCO2 relative to those grown at ambient levels. Average ambient and eCO2 levels across all the non-FACE studies are 365 ppm and 732 ppm respectively. Other details are in the legends for Figures 2 and 3. The effect of CO2 at FACE centers. Change (%) in the mean concentration of chemical elements of plants grown in Free-Air Carbon dioxide Enrichments (FACE) centers relative to those grown at ambient levels. Average ambient and eCO2 levels across all the FACE studies are 376 ppm and 560 ppm respectively. Other details are in the legends for Figures 2 and 3. The effect of CO2 at various locations and latitudes. Locations of the FACE and Open Top Chamber (OTC) centers, which report concentrations of minerals in foliar or edible tissues, are shown as white dots inside colored circles. The area of a circle is proportional to the total number of observations (counting replicates) generated by the center. If the mean change is negative (decline in mineral content), the respective circle is blue; otherwise, it is red. The figure reflects data on 21 minerals in 57 plant species and cultivars. The shaded region (between 35 N and S latitudes) represents tropics and subtropics. The systemic aspect of the CO2 effect. 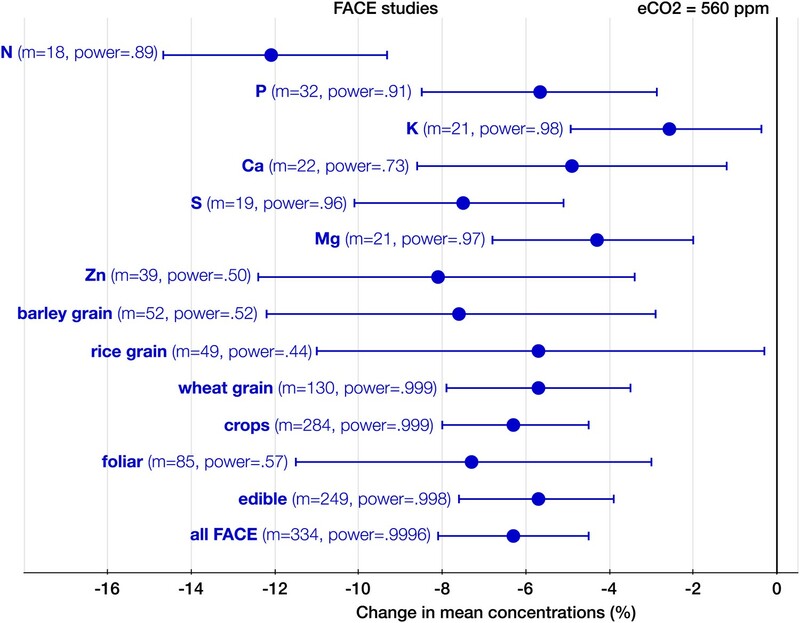 Change (%) in the mean concentration of minerals in plants grown in eCO2 relative to those grown at ambient levels. All the results in the figure reflect the combined data for the foliar and the edible tissues. The number of total mean observations (m) for all the measured minerals across all the studies for each crop/plant group, experiment type, country, or region is shown with the respective statistical power. Country specific and regional results reflect all the FACE and Open Top Chamber (OTC) studies carried in any given country/region. 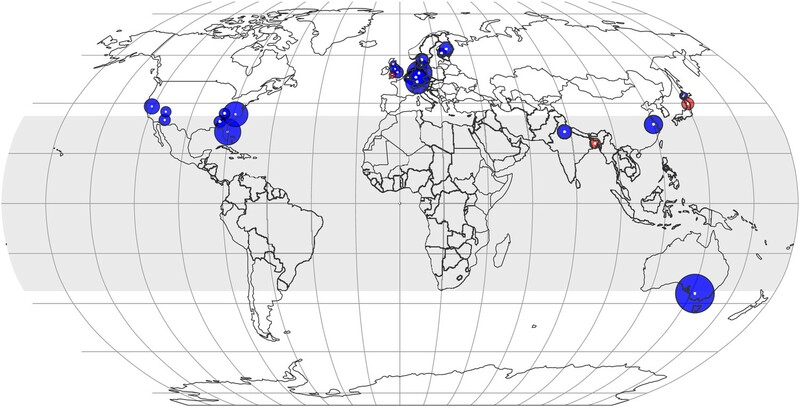 The number of total observations (with replicates) for all the minerals (not counting C and N) for each country is as follows: Australia (926), China (193), Finland (144), Germany (908), and USA (1156). Other details are in the legends for Figures 2 and 3. A funnel plot of the effect size (the natural log of the response ratio) plotted against the number of replicates/sample sizes (n) for each study and each mineral in the dataset for C3 plants. The plot provides a simple visual evaluation of the distribution of effect sizes. The blue line represents the mean effect size of eCO2 on mineral concentrations: the decline of 8.39% (yielding the decline of 8.04% when back transferred from the log-form). 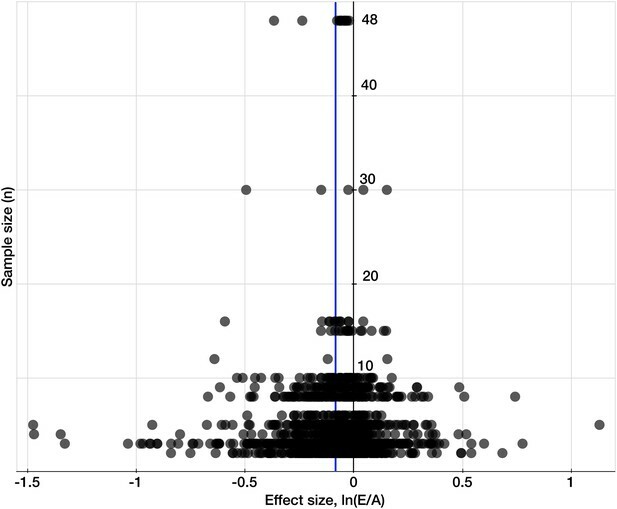 The symmetrical funnel shape of the plot around the mean effect size indicates the publication bias in the dataset is insignificant (Egger et al., 1997). Comparing the effects of CO2 on two plant quality indicators. 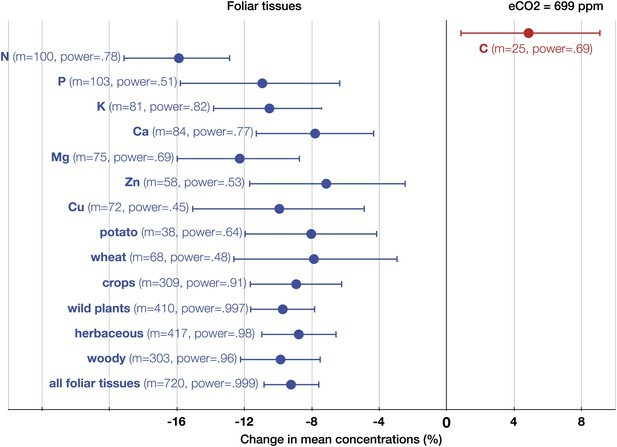 CO2-induced changes (%) in C:N (a quality indicator often used in CO2 studies) and in TNC:protein (a rarely used but nutritionally important indicator) for wheat grains and for foliar tissues of various plants. The results shows that in the same plant tissue, eCO2 can increase TNC:protein up to several-fold > C:N. Significant CO2-induced shifts in the ratio of major macronutrients are probable. Hence, it is important for CO2 studies to start accessing and reporting changes in TNC:protein. in lieu of protein, N content is used. 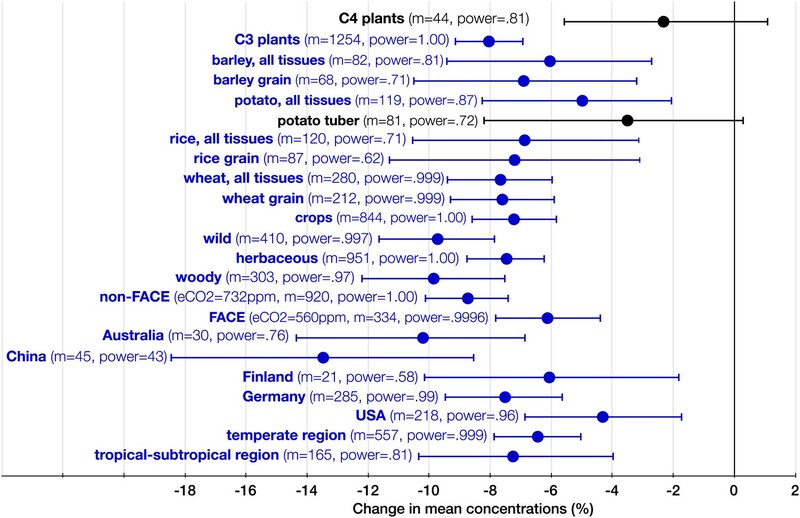 Changes (%) in various plant quality indicators caused by: (1) Adding a teaspoon of TNC (∼5g of starch-and-sugars mixture) per 100g of dry mass (DM) of plant tissue, an:d (2) growing plants in twice-ambient CO2 atmosphere. Changes due to the addition of TNC are calculated assuming:the baseline TNC content of 65% for grains and tubers, and 15% for foliar tissues. The C content is assumed to be ∼42% for plant tissues and TNC. 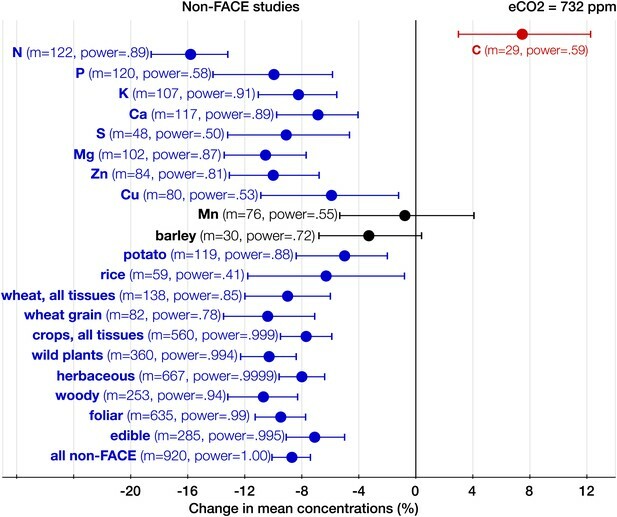 Studies covered in the meta-analysis of CO2 effects on the plant ionome. The table provides species name, common name, the type of experimental set up, the level of CO2 enrichment, and indicates whether the species is a crop. Countries are listed only for FACE and OTC type experiments with ‘Europe’ accounting for combined data from Belgium, Denmark, Finland, Germany, Sweden, and the UK.